Seven layer bars are awesome – sweet and gooey, with the complimentary flavors of the chocolate chips, coconut, and cookie base. That said, I really don’t like sweetened condensed milk and usually don’t have graham crackers on hand. 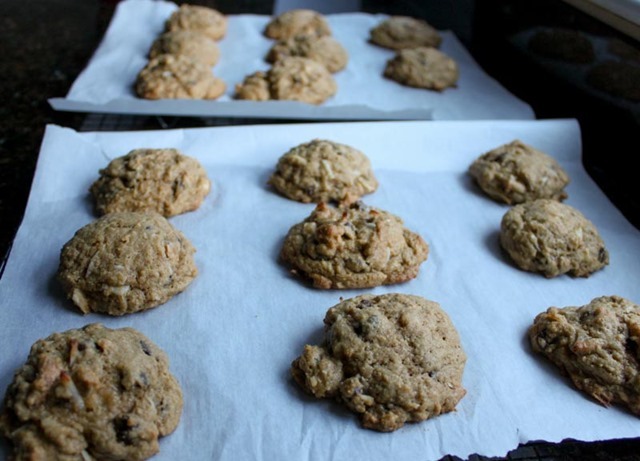 I had the idea to morph the recipe from bars into cookies, using all the classic ingredients. This recipe is the result – soft cookies filled with coconut, chocolate chips, and macadamia nuts and drizzled with luscious caramel. Start by making the caramel. 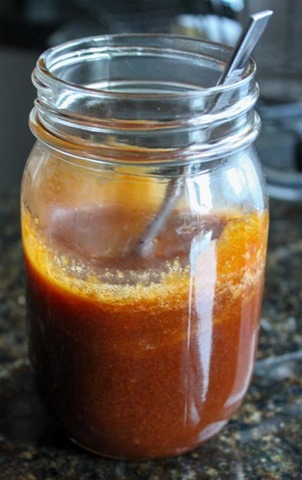 Over medium-high heat, melt the butter and sugar together until the mixture is smooth and a dark amber color. Add the salt and turn off the heat. Slowly add in the cream and be careful when the mixture bubbles up! Stir to combine. Add the baking soda and watch again for bubbling! Stir again until smooth and set aside to cool while you make the cookies. In a stand mixer (or big bowl), cream together the butter and sugar. Slowly add in the egg and vanilla. When the wet team is thoroughly combined, add in the dry ingredients one at a time. At this point gauge how dry your dough looks and add the water if it seems too crumbly. 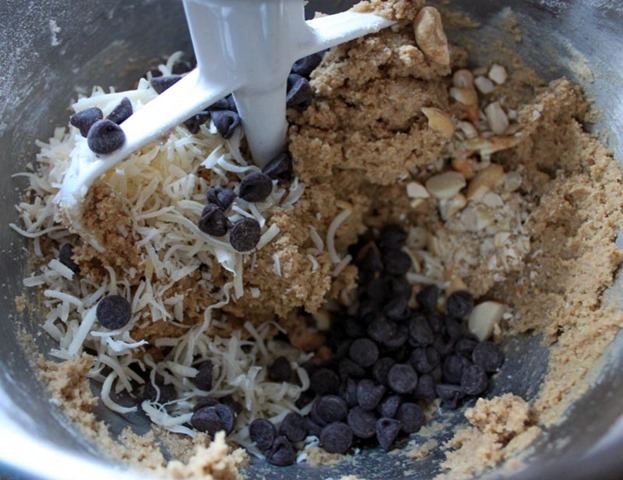 Add the chocolate chips, nuts, and coconut last. No need to overmix towards the end, just make sure the ingredients are equally distributed. Scoop the dough into 1” balls with a spoon or small disher (I use my handy dandy #20 ice cream scooper). 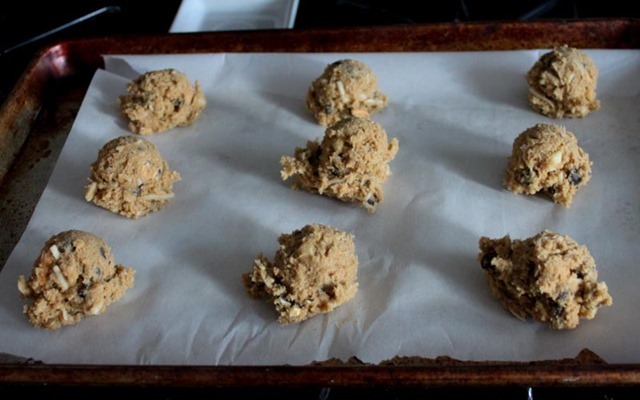 Place the dough balls on a parchment paper lined cookie sheet and bake on 375 degrees for 10 minutes total, rotating once at the halfway point. They may seem underdone when you take them out but you want that (it’ll ensure the cookies are soft and chewy). Remove from the oven and move to a wire rack to cool. 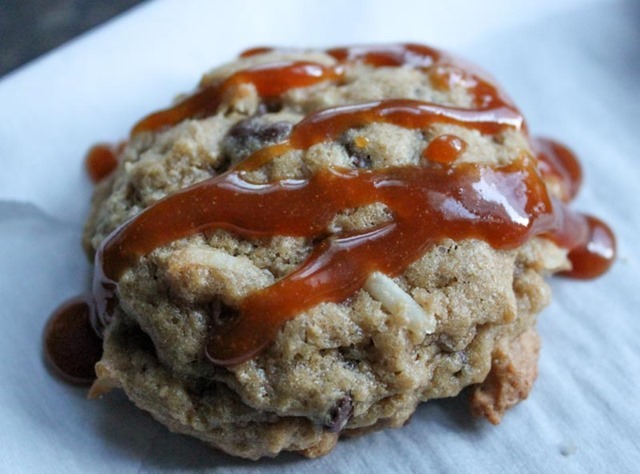 When the cookies have fully cooled, drizzle with the caramel. 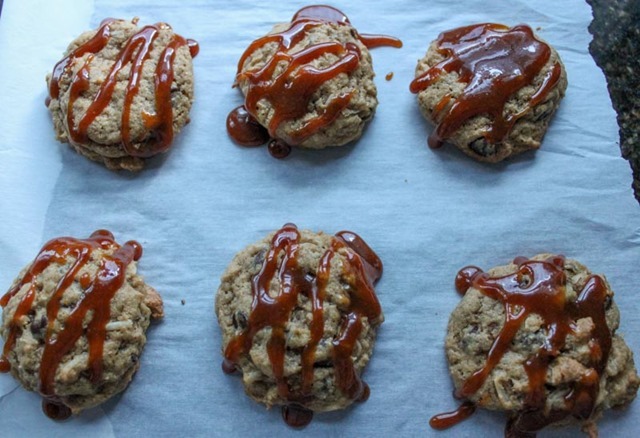 You’ll likely have extra caramel leftover but that’s never been a bad thing in my house. These cookies are everything you love about a traditional seven layer bar but with an improved design and made with better ingredients. I think this is my new favorite cookie. I hope you like them too! I totally agree – thank you!